Okay, so I’ve decided to sign up for The Sawdust Chronicles (TSDC) challenge to build a desk organizer. Never mind that this is a busy month for me, and that we’re moving on top of that. So on Saturday I went to the lumberyard and looked for – um, lumber. I was looking for something that was under 3/4″ thick, but they didn’t have anything. However, they said they could rip some 1 1/4″ thick stock (is that 5/4? I’m still not up on all the lumber lingo), and then plane it down to 1/2″ for me. Sweet, done! So here’s what I got. I estimate it’s about 7 board feet, including that little thin strip. The wood is all kapur, which is just about all that this lumberyard carries. I chose some slightly darker and redder stuff for that thin piece just to add some natural contrast. I pretty much have the entire thing planned out in my mind. And I’m surprised at how fun it is just to think about woodworking. I can stare at my sketch for a good 10 minutes or more, just thinking and tinkering with the plan. 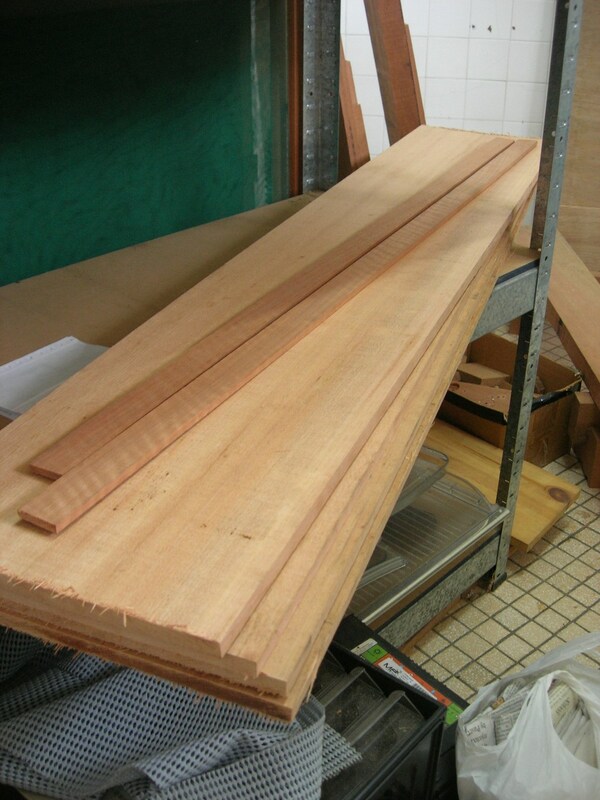 And when I’m not thinking about this organizer, I mentally build the Roubo. Not sure when I’ll have time next to actually put tool to wood, since I’m going out of town this week. But of course, pics will follow once I do! Pleased that you posted another entry (positive reinforcement…). Pics are always a bonus.